bought as gifts for my 2 sons and they love them. Holds everything they need and not to bulky. 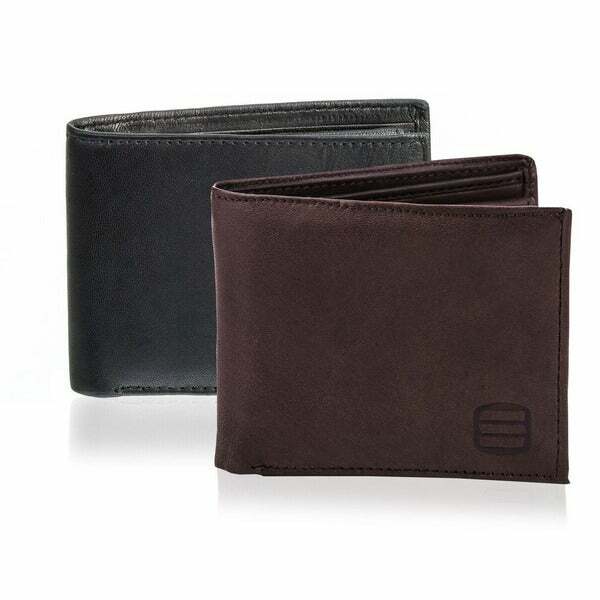 Feel secure and stylish with this rich leather bi-fold wallet from Suvelle, the slim sleek design stores your valuables without all the bulk and ensures comfortable carrying in any pocket. The Suvelle Men's Slim wallet features many interior pockets to keep you organized, there's a place for everything - credit cards, cash, extra slips, photos and ID to keep your essentials close at hand. The Suvelle Men's Slim Genuine Leather Bifold Removable Flipout ID Window Passcase Wallet keeps your everyday essentials stylishly well protected while you're on-the-go, constructed from soft, rich genuine leather, it offers a divided bill section that helps split larger bills from smaller ones easily, 7 card slots 4 on one side of the fold and 3 on the other side of the fold, 2 slip pockets one on each side behind the card slots, a removable insert flip out clear ID window with a thumb-slide, 2 additional card slots on ID flap. Easily show your ID without taking it out of your wallet, and easily remove ID if asked with the removable flip up ID insert. This Suvelle Men's Slim Genuine Leather Bifold Removable Flipout ID Window Passcase Wallet Extra Capacity makes a perfect gift to that special someone on that special day!!! I bought this bifold wallet as a present for a friend.It is a really nice wallet.It is thin which he likes alot.The leather is a quality leather,it looks impressive.The removable ID window is a nice perk.A good buy. This bifold wallet is very nice. It has plenty of room for all your cards. It has a clear id holder. The money slot is separated into two different pockets. Overall this is a great wallet. This wallet works great. I needed a wallet for o=some extra cards I dont use all the time. So I wanted one more for credit cards and holding those. I dont really need a wallet for pictures. Cash and bills are nice too. This leather is pretty soft but it closes nicely. Bought for my boyfriend as a gift. He prefers the wallets that have the removable id case. This is soft leather and seems well made. Will buy him another when this one gets worn out. This is a great wallet. Very soft and fits my cards perfectly with a nice removable piece for when I just want to carry my id and one card. Great for not ruining the lines of my clothes when I'm out. Very well made slim leather wallet. Very comfortable when sitting. Leather is very soft and the color is perfect. Would recommend this wallet. My boyfriend loves it! Good quality for a good price! Was fair priced and is soft and well stitched. This is a very nice wallet. Folds very flat, made of good quality leather. 2 days ago they said my order was delivered. I'm still waiting for it to show up. It hasn't even made it to the town I live in. I emailed Overstocked and still waiting for a response. What's up with that!? "Can this be carried comfortably in the front pocket?" "do you ship to saudi arabia?" This item can be shipped to Saudi Arabia. If applicable, Taxes, Duties and Shipping costs will be added during Checkout. For Additional Information, please visit our International Help Center (https://help.overstock.com/app/answers/detail/a_id/5752/). "Are the dividers between the card slots leather?" They are mostly fabric with leather trim at the top half inch (3/4"?) or so. My boyfriend needs a new wallet and this one has a detachable ID insert!